With DSLR cameras you can take beautiful astro photos, but it is quite frequently extremely difficult to point the camera into the correct direction of your chosen object on the sky, if the object is very faint as you cannot see it through the viewfinder not in live view. 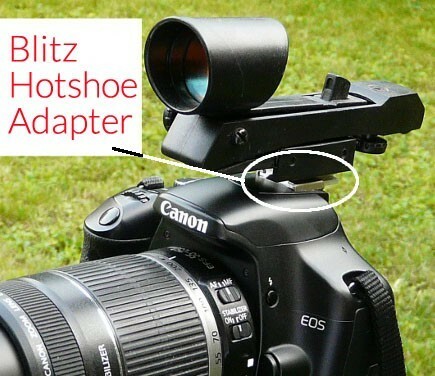 The Blitz Hotshoe Camera Adapter offers an inexpensive solution. It is compatible with not only DSLR cameras, but also with Vixen Polarie star tracker. The CNC machined hot shoe adapter makes it possible to attach accessories to the camera via the hot shoe of the camera and also the Vizen Polarie Star Tracker. A locking screw is used to safely attach to the hot shoe. 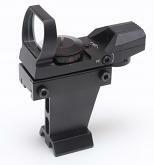 The dovetail rail of the adapter has a width of 15mm, and can only accommodate star pointers of appropriate width. The Skywatcher Red Dot Finder (model 20743), Celestron Star Pointer (model 51630) and 365Astronomy Red Dot Finders will certainly fit, but there might be other models that will also fit. Measure the distance between the rail edges on your existing red dot finder and if it's about 15mm, there is a chance your red dot finder will be compatible. Please note that SONY and Minolta cameras has got a different hotshoe, therefore you would need to buy a converter adapter that is available from third party suppliers on the internet. Images are for demonstration only. Camera and red dot finder are not included. Blitz Hotshoe adapter installation. 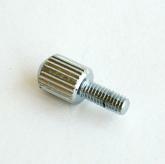 First of all check out if there are two tiny grub screws screwed in at the front end of the adapter. These are very tiny and difficult to spot. Sometimes these fell out from the thread during transportation, so if they are not there, carefully check out the content of the plastic bag, these are very tiny: diameter 2mm & length 3mm.) Once you found and reinstalled the screws (you’d need an Allen key 1.5mm size), slide the adapter into the hot shoe of your dSLR camera, then secure it with the two tiny grub screws. 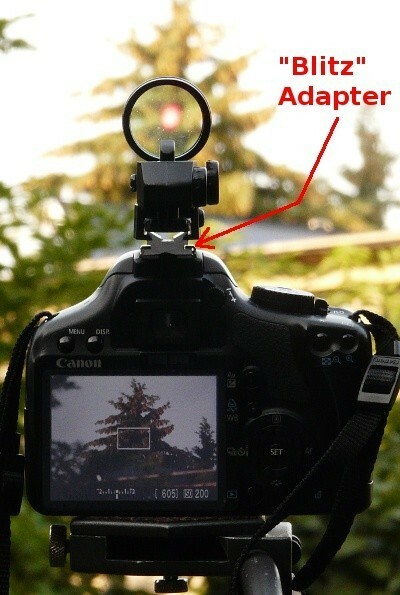 Once the adapter secured, install the red dot finder onto the top V-shaped part of the adapter. Enjoy! Red dot finder worked great but like an idiot I bought the adaptor and then the finder separately so the whole lot cost me more. I found the base of the adaptor was about 0.15mm too thick to go into my NikonD300 and D60 hot shoe mounts so needed thinning with wet n dry paper. Not sure about the â€œCNC manufacturedâ€ looks more like a extrusion process. The securing grub screws are obscured when the red dot finder is attached but just sliding it in to the hot shoe is secure enough without these being tightened up. The switch just needs turning on to get a bright enough dot, turning the voltage control all the way makes it so bright it obscures the sky behind. Not five out of five but not bad for the money.